Hotels in Paris from € 78.00 - Book direct! You are about to book a hotel in Paris. We would therefore like to give you some extra information about the city. Paris is one of the most romantic cities in the world and is also the capital of France. The city counts about 2.2 million inhabitants and is divided in two by the river Seine. The city is known for its cultural highlights, fashion and great restaurants. Paris is the right spot for culture lovers. The city has a broad offer of culture, theaters and museums. The most famous highlights of the city are probably the Eiffel Tower, Arc de Triomphe and Notre-Dame. These are all definitely worth a visit. With the Louvre, Paris has one of the most famous museums of the world. Here you can find the world famous painting of Mona Lisa made by Leonardo da Vinci. It is also recommended to visit Museum de Orsay and Centre Georges Pompidou(modern art). Other highlights are: Sacré-Coeur, Dome des Invalides, Sainte-Chapelle and Panthéon. You could also go to the picturesque districts Le Marais or Ile Saint-Louis. These districts managed to keep their own unique atmosphere despite the influence of the big city. Those who love to go to the theater could pay a visit to Opéra Garnier. Furthermore, if you would like to go shopping, you could go to the Champs-Élysées or Les Halles. After a busy day full of culture and shopping, you can go to Jardin du Luxembourg to relax. Paris’ nightlife is excellent. Most bars and clubs are concentrated around Place de la Bastille. Those who visit the city with children are recommended to go to Disneyland Resort Paris and sports lovers are recommended to visit a match of local football club Paris Saint-Germain (PSG) in Parc des Princes. Paris is very easy to get to. From Amsterdam, it is about six hours drive. You could also choose to travel by train to one of the cities’ stations such as Gare de Lyon and Gare du Nord. The cities’ public transport is very well-organized. Paris has for example, an extensive metro network. It also has three major airports: Charles de Gaulle Airport, Orly Airport and Airport du Bourget (business airport). These airports serve numerous destinations worldwide. 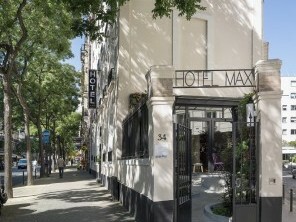 At this very moment, there are 2 hotels in Paris with availability on hoteliers.com. These intimate and comfortable hotels have very neat rooms which are fully equipped. You will therefore always start your stay in Paris with a good feeling. On this page you will find our selection of hotels in Paris. The prices are per room per stay in the hotel in Paris of your choice.